Mike L. asks: What is the chemtrail smoke behind airliners? Our attention was first drawn to the sky by the sudden appearance of several strange and startling clouds- long, graceful, looping ribbons of white. These were tapering to a point at one end, and at the other, where they dissolved into nothingness, 60 degrees across the sky, were about as broad as the width of a finger held arm’s distance from the eye… One close observation we noticed some distance ahead of each cloud point the tiny speck of a chase plane. Apparently the churning of the air was all that was needed to upset the delicately balanced meteorological conditions and precipitate this strange cloud formation…. I had seen ships leave their tracks in the clouds, similar to those of little sea animals in the wet sands at the shore, but never before had I seen a plane writing in white upon the blue slate of the sky! With the rise of commercial airline traffic, these peculiar cloud formations behind planes have become commonplace. But what actually causes contrails, and why don’t they always appear behind planes? 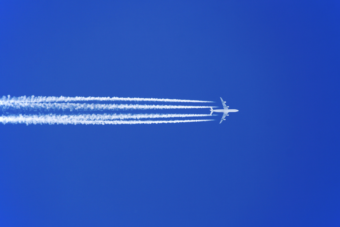 Contrails are created by planes via one of two ways- first, as the airplane passes through the air, it creates areas of low pressure, for instance, above the wings as a byproduct of the wing shape. This sudden drop in pressure can cause the air temperature to drop below the dew point around certain parts of the plane. If this happens, water in the air may condense into little droplets. These droplets may even freeze if the air temperature is cold enough; but either way, the result will be a usually very short-lived streak of water vapor behind the plane. Beyond potentially seeing this just behind or above the wing flaps when they are extended, in some cases, you can briefly observe this phenomenon in the vortices of air created at the ends of the wings. In this case, you’ll see spiraling, corkscrew looking vapor trailing the plane’s wing tips. You may also observe this effect in the intake of the engines of commercial airplanes if humidity levels are high enough. As in the other cases, this is caused by a drop in air pressure resulting in water condensing in the intake, creating something of a little cloud inside said intake. Similarly, you occasionally might see contrails form at the tips of propellers in certain conditions for the same reason. All this said, these types of contrails aren’t the ones you’re seeing when you look up high in the sky as commercial planes fly over head. Rather, this type of low-pressure induced contrail is more likely to show up when a plane is making high speed maneuvers in high humidity air. For example, it’s not uncommon to see this when a fighter jet takes off from an aircraft carrier. So what about the far more commonly observed contrails streaming behind planes flying at high altitude? These are a byproduct of burning jet fuel in air that is extremely cold, though otherwise aren’t really any different than the former contrails- they’re both caused by water condensing, just in one case it’s the water already in the atmosphere condensing, and in the other it’s water that’s introduced into the air. Specifically, as the jet fuel burns, aside from other things the exhaust introduces into the atmosphere, like unburned fuel and various particles, it mostly expels carbon dioxide and water. When at high altitude where temperatures are often well below freezing, this expelled water vapor, combined with the various particles also expelled providing nucleation sites for the water, will sometimes condense and then freeze, with the result being a long, white cloud formation behind the plane. This usually begins at some distance behind the engines as when the exhaust is initially expelled, it is quite hot. This is not totally dissimilar to how when you breathe out from your mouth during winter you’ll often see white vapor forming several centimeters outside of your mouth as the moisture in your breath encounters the frigid air around. Further, if the air is quite dry, the mini-cloud forming outside your mouth will tend to dissipate very rapidly, whereas in days with higher humidity it will last a little longer. A similar thing occurs in planes, but thanks to significantly more water vapor, a lot of nucleation sites being expelled, and often all occurring in more extreme temperatures, the contrails may last for many hours. Further, if the humidity is high enough, they may even potentially expand into otherwise natural looking cirrus clouds. This occurs as water from the surrounding atmosphere condenses around nucleation sites in the contrails and winds slowly disperse the contrail over a wide area. This tendency of contrails to stick around for long periods of time is also a phenomenon that’s been regularly observed from the earliest days of high altitude flight. Can You Really Avoid a Baggage Fee by Wearing All Your Clothes? Meteors can also cause contrail cloud formation and this phenomenon has been documented for thousands of years. 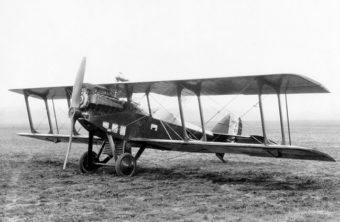 In fact, when one Major Rudolph Schroeder attempted to set a new altitude record in February of 1920, his plane’s rather rapid descent after he passed out around 36,000 feet was initially misinterpreted by people on the ground as a meteor falling- you see, they couldn’t see his little plane- an open cockpit Lepere biplane- from that far away, but could see the contrail that formed behind it as it plummeted towards the Earth. As for why he suddenly found himself in such a dive, it turns out Schroeder was suffering from oxygen deprivation. In an attempt to find his emergency oxygen, he briefly removed his goggles to see better, with the result being the moisture on his eyes almost instantly freezing. Not long after, he passed out, only regaining consciousness a few thousand feet above the ground, at which point he was successfully able to pull out of the dive and land, despite his vision being damaged- it turns out partially permanently. While many scientists correctly hypothesized what caused contrails once they started popping up around WWI, it wouldn’t be until after WWII that a solid theory on exactly what conditions contrails would form was settled on. In America, one Herbert Appleman ultimately came up with such a system of prediction in 1953, with his guide on the subject widely used for decades after. It was no coincidence that concerted effort into figuring this out was put forth during WWII. Contrails provide a major problem for military planes trying to go unnoticed, and thus there was great need to figure out what exact atmospheric conditions were likely to produce contrails, so the military planes could avoid those regions. Unfortunately atmospheric conditions are notoriously unpredictable and so even with such a guide pilots also had to keep an eye out for whether their plane was producing a contrail at any given moment. Towards this end, the U2 spy plane was equipped with a rear view mirror to allow the pilot to see if such was happening. If it was, the general rule was to adjust altitude until the contrail stopped forming. Other efforts by the military have been put forth to try to stop contrails from forming via tweaking the makeup of the fuel, so as to produce less particles in the exhaust, and thus less nucleation sites for the water vapor to condense around. Why Do People Believe in Chemtrails? What Really Comes Out of Airplane Contrails? Who Made Those Aviator Sunglasses? Please note that the condensation trails you’ve described in the article are indeed ‘contrails’ while the ‘chemtrails’ you used in your (clickbait) title are the product of conspiracy theorists who lack a basic understanding of physics. I feel this should’ve been made clear in the article (you only mention ‘chemtrails’ in the title, nowhere else, hence I call it clickbait). The question asked by the TIFO visitor was using the name chemtrails and I explicitly mention it in the opening sentence and then say what they’re actually called. Most people have not heard of contrails and only know them as chemtrails. So using chemtrails in the title was more appropriate there so more people know what the article is going to be about, which is kind of the point of a title. Clickbait is where you get people to click, but don’t deliver on the title. This article goes into great detail talking about exactly what the title says. In response to Daven, the article begins with “So called “chemtrails,” though more technically known as contrails, …” Although you use the correct term (contrail) in the remainder of the article, you don’t attribute the first use of “chemtrail” to conspiracy theorists. Readers who only read the first paragraph will not see your (somewhat covert) use of the correct term in the rest of the article. For a history of this term, identifying the first known web reference, see: http://contrailscience.com/a-brief-history-of-chemtrails/. Even I got puzzled about the “chemtrail” but later found that you corrected that word in the following context of the article. Anyways, I really enjoyed the insights that you have shared in this post, I always love watching those trails, leaving alone the science behind it.